Over time, the daily environmental stressors the skin faces begin to take a visible toll. This leads to dull, dry, aged skin. Fortunately, proper nourishment can help slow this damage, promote a youthful glow, and help skin defend itself against future damage. Kyani's Brightening Day Creme was designed to give skin the proper dose of moisture and nourishment to help it look and feel as youthful as possible. Clicking 'Buy Now' will direct you to the 100% secure main Kyani website, where you will complete the purchase. Not in Australia? Click here to place an international order (shipped fast locally from your own country). 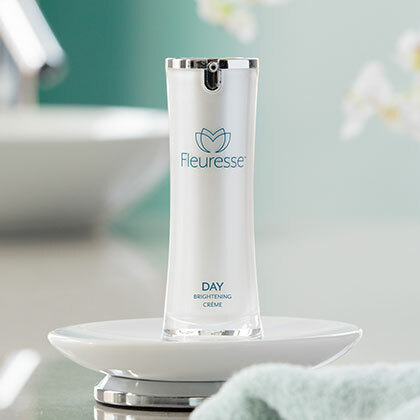 The Fleuresse Brightening Day Crème was created to calm, soothe, and nourish the skin during the day by providing intense hydration along with vitamins and natural extracts. The rich formula helps soften wrinkles, brighten the skin’s tone, and smooth skin’s texture. Apply the Fleuresse Brightening Crème generously to the face and neck, with a particular focus on areas with environmental or sun damage. Allow the cream to dry completely prior to applying makeup.